Tompkins County should be a place where natural features and working rural landscapes are preserved and enhanced. Preserve natural features and ecosystems, especially within the Natural Features Focus Areas. Protect farmland within the Agricultural Resource Focus Areas for agricultural use. Reduce the adverse impacts to native species and ecosystems caused by invasive organisms and climate change. Promote best management practices that protect natural resources and productive working lands. The Tompkins County Conservation Strategy presents eleven specific strategies to conserve critical identified resources in the County over a ten year period. This strategy is based on the recommendations of the Tompkins County Conservation Plan, which includes analysis, findings and recommendations for both natural and agricultural resources. Other agency and community partners’ plans were also considered in the development of this strategy. The Tompkins County Conservation Strategy recognizes that protection of Tompkins County’s natural and agricultural heritage requires coordination with agency and community partners and collaboration with willing and interested landowners in the County. The final Conservation Strategy was endorsed by the Tompkins County Legislature October 2, 2012.
develop outdoor recreation facilities, within the focus areas, that are intended to serve all county residents. As of March 2016, the Fund has been utilitized to permanently protect over 830 acres in five different municipalities. For information about the Fund's guidelines, see here. Tompkins County, in close cooperation with Cornell Cooperative Extension and Town governments, works with farmers to access New York State's PDR program. 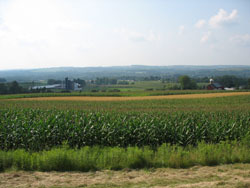 The State's program is called the Farmland Protection Implementation Grants Program and is administerred through the NYS Department of Agriculture and Markets. Tompkins County has worked with five different farmers in two towns to leverage over $3 million to permanently protect over 2,200 acres of high priority local farmland. To learn more about the County's PDR program, see here. Natural Features Focus Areas. Each of the fourteen Natural Features Focus Areas included in the Tompkins County Comprehensive Plan has an individual plan that provides detailed information about the unique charactersitics of the area and outlines a tailored approach to implementation.